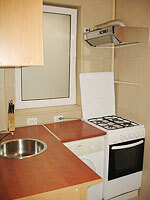 Find cheap accomodation in a Bucharest apartment. EastComfort has more than 50 quality apartments in Bucharest, sorted by price, or by the number of guests. View our list of apartments and choose one. Sala Palatului, RENTED FOR LONG TERM!!! An elegant, spacious and comfortable apartment in Bucharest, but above all warm and beautiful. The large living room is suitable for both business meetings and leisure time, being endowed with a comfortable sofa, two armchairs, cable TV, bookcase. A fancy balcony can be accessed from here. The same harmony characterizes the bedroom: the master bed, the large mirrored wardrobe, night stands and difuse lighting assuring a deep sense of privacy. The kitchen mixes the utility with beauty, being well fitted for self-catering (cookery, fridge, ustensils, plates and glasses). The bathroom, with lavatory hand, washing basin, shower cabin, cosmetics cupboard provides a convenient stay and also a cheap accomodation. Well-located in a residential area, all you feel like trying to experience is a step away: great dinners (shoarma) or hanging out with your friends. Culture centers and historical edifices of great importance for the Romanian people are to be found all over the area.